One of the most unique privileges I got as a guide for Holiday was to work the University Of Utah Burn Camp trip. Burn Camp is an experience that is difficult to put into words, but I’m going to try. Each summer, Holiday River Expeditions sends a chartered, six-day trip down the stunning Desolation Canyon with an extraordinary group of kids. Although these kids come from many places, the unifying element in their past is that they’ve all been treated for severe burn injuries at some point in their lives through the University of Utah Hospital Burn Unit. There are varying degrees of injury; some of the kids have a single skin graft on an arm or leg, while others have significant scarring over much of their bodies. Counselors on the trip range from local SLC firefighters to Burn Unit nurses and psychiatrists to volunteers. Holiday guides serve as para-counselors, gaining the cherished experience of getting to build individual relationships with these kids that have become, out of necessity, much more aware than the average teen about things like pain, life, and death. For six days, the kids get to enjoy long days on the water, trading stories and going on side-hikes. Water fights are something of a legend at Burn Camp, and have been known to reach near-apocalyptic levels at times; particularly when the firefighters get involved. After all, these guys know how to aim a fire hose, so maximizing efficiency in blasting others with water buckets is second nature to them. The campers are involved in the trip process itself, fostering a sense of ownership and pride. It isn’t a luxury cruise; kids fire-line literal tons of heavy gear on and off of the boats, help cook extravagantly delicious meals, and tend to camp logistics. Late nights find the campers trading stories and jokes around a fire. Burn Camp staff dedicate at least one night to a therapeautic sharing circle centered around burn stories, the emotional ramifications, and a general atmosphere of deep sharing. Nothing requiring so much coordination as this spectacular adventure can be done without a tremendous investment of time and self. The man behind it all is Brad Wiggins, lead nurse in the Burn Unit in Salt Lake City. Brad’s charisma, passion, and energy are contagious. From the moment he sets foot onto the mosquito-riddled shore of Sand Wash at the trip put-in, he gushes enthusiasm and joy. Joy to be with kids he and others have seen recover from and defeat the crushing lows of life-threatening and life-altering burn injury… joy to be on the river, navigating rushing rapids… and joy just to be around people he loves. Brad’s commitment to Burn Camp spans over two decades, and manifests year-round in the numerous and intimidating fundraising and logistical undertakings of his that make the Burn Camp wheels turn. For seven years now, the chief fundraiser has been the Burn Camp auction and dinner event. 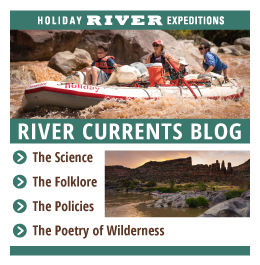 As a co-sponsor, Holiday River Expeditions has the privilege of sending representatives to the event (usually our Operations Manager, Tim Gaylord, and guides or other folks that have been involved with the program in some way over the years. A Holiday River Expeditions trip is also auctioned off, along with impressive items that span a wide range of interests; a drum head autographed by seminal punk rock band Blink 182, a day of paragliding, a kayak, a guitar signed by Megadeth, numerous spa packages, romantic weekend getaways, ski weekend vacations, beauty and health care products, all the way down to simpler tastes like candy or restaurant deals and coupons. There’s something for everyone; and the fun is in seeing how great of a deal you can get while knowing every dollar goes to a worthy cause. I was lucky enough to guide on the Burn Camp trip for three years; three years that changed my life. It gives me great pride to be involved with a company that is integral to such a morally praiseworthy and admirable cause, powered by compassionate people and their tireless energy. This ongoing nature and its strength speak to the personal nature of small business and whitewater adventure. It’s our hope that this has given you another snapshot of the spirit of the company that is, above all, dedicated to giving you a special and unforgettable experience on the river.